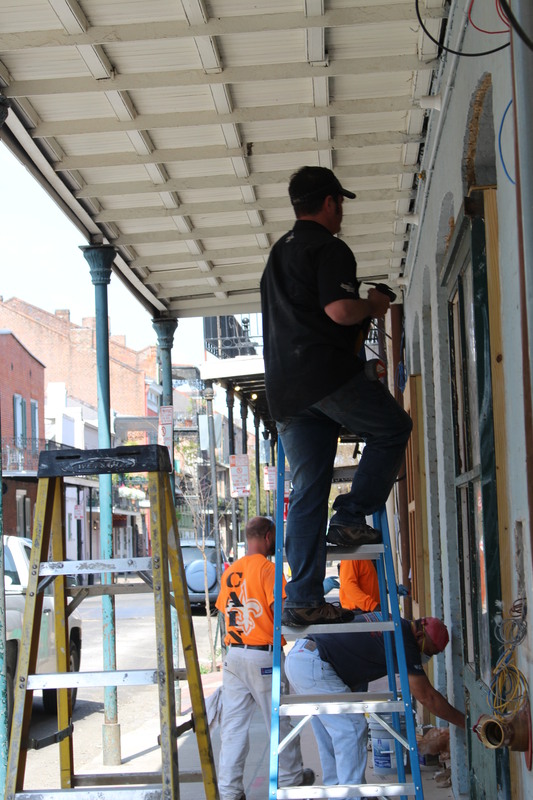 Men at work: Nawlins, French Quarter | Oh, the Places We See . . .
You might think that a city that parties into the wee hours would sleep in, barely seeing morning light. But that’s not what we found. In our quest for early, near-dawn French Quarter beignets at the legendary Café du Monde , we spotted ’em. Men. That’s right, strong, hale and hearty, Louisiana men. Up and at ’em just barely into what we’d call first light. Workin’ it. And, for the most part, likin’ it. Some were handy with buildings. Like the Cabildo, Louisiana’s State Museum, situated next door to St. Louis Cathedral on Chartres, facing Jackson Square. Men on scaffolding putting a shine to the old façade. Readying it, no doubt, for another century of housing artifacts and welcoming visitors. Others, however, did the work that needs to be done over and over in a city of oldness and antiquity and ever-changing owners. 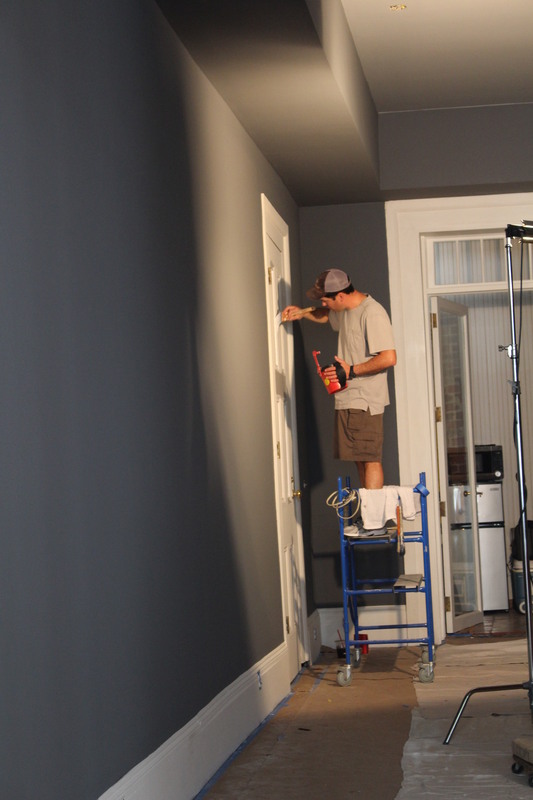 Painters, fixer-uppers, and tinkerers transforming old to new. And trimmers of branches once dripping with Mardi Gras beads. Repairing a door on St. Charles Avenue. Old color: blah. New color: gunmetal gray. 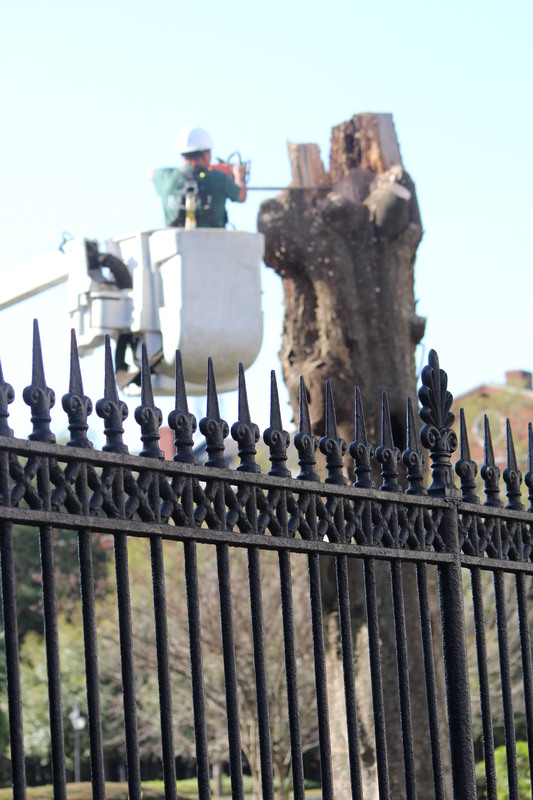 Trimming branches in Jackson Square. Next door, St. Louis Cathedral was in need of dusting. And sweeping. And you would be too, if you welcomed visitors all day, every day. And then there was other religious work. Necessary religious work. There were men working with horses. Moving up in line as one horse and buggy was chosen at the front, and then another, and so on and so on. Or maybe they were just talking about the day. Or the weather. Or the patrons. Music makers were up early, too. Or maybe they never went to bed. Like this bagpiper. Looks happy, doesn’t he? Dapper, too. Already done at Jackson Square. Moving on. Or the foursome on Royal Street entertaining the coffee crowd on a closed-off street. Playing on Royal Street to a welcoming, early-morning crowd. And the man caught up in soft-hammering a thingamajig to evoke soft, moving Calypso notes blending with Cajun and Creole and Jazz. Moving with those Calypso sounds. A man who knew his business — and took it seriously — served us café au lait and sugary mounds of soft doughy pillows at the Cafe du Monde. He’d definitely done that a time or two. Serious server at Cafe du Monde. While a man of Jesus professed his faith and sounded the trumpet. All part of the morning’s entertainment. And sermon of the day. At least one man was singled out for superior work. There’s an art to everything, I guess. Posted on store window — Shoplifter of the Month! And, of course, there were artists. Plain-clothed and otherwise. It’s an artsy place. Ya gotta give it that. Up early and painting in the cool morning hours — a street artist near Jackson Square. French Quarter Golden Man — ready for pictures. And donations. Bu all in all, what’s better than doing the work you love in a city you love? Nothing we can think of. Unless it’s watching men at work. Feeling the vibes of a morning in the Quarter. Hope you enjoyed our early morning observations in New Orleans. Watch for more pics of life in the Quarter in our next posts. 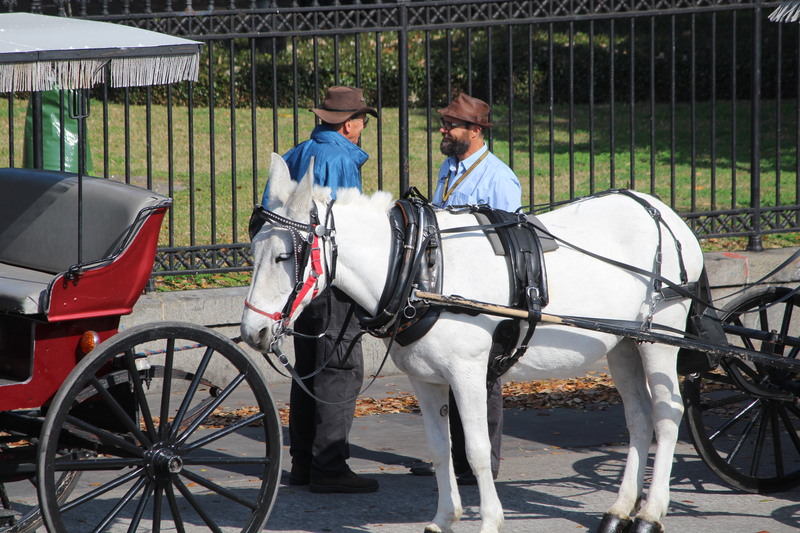 This entry was posted in Louisiana, New Orleans, Travel and tagged Cafe du Monde, French Quarter, New Orleans, St. Louis Cathedral, working men. Bookmark the permalink. love these pics, Rusha. They make me smile. It was fun seeing so many men busy in the Quarter. Love NOLA and you caught it at its early morning best! Wonderful!! Thanks, Martha. We love the Quarter at any time, but I’m not much of a night owl. And that’s when most people love to party. So the alternative for me is early morning. And this time, I just noticed all the other people that were busy! Thanks for commenting! I can see why people would say NOLA is touristy. Because it is. But we’ve been going there for many, many years now. We both grew up about 45 minutes away. Even today, we look for off-the-beaten-path restaurants and shops. 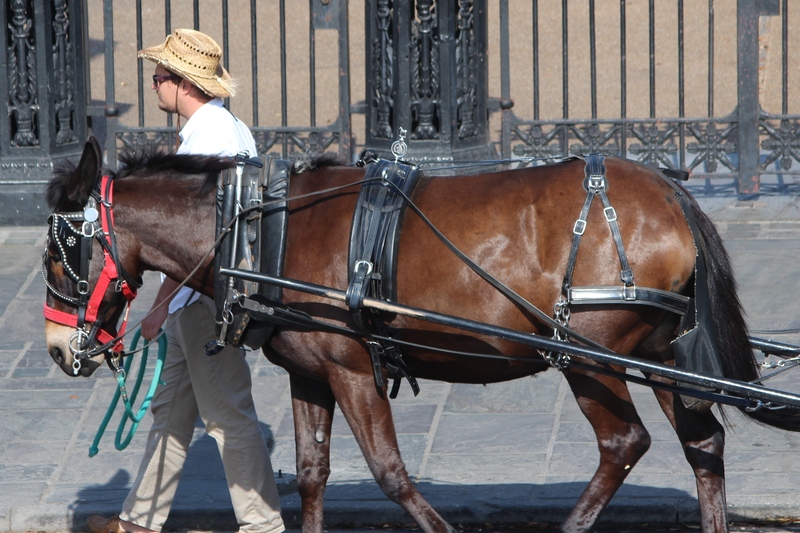 There’s plenty to do that’s not on Bourbon St. — you just have to think like a local. Thanks for stopping by. Hope you get there soon!